The ISU chapter of the NSA on campus is a non-profit organization dedicated to the support of people who stutter. It provides a safe and friendly atmosphere for people who stutter, and those affected by stuttering. AT meetings you will be able to: meet others who stutter, share experiences, practice your speaking skills, and work on moving forward with dignity and respect. COME SOCIALIZE AND LEARN ABOUT STUTTERING! 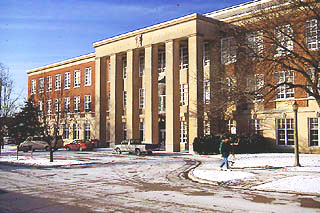 Fairchild is located at the intersection of Dry Grove Street and Main Street. You can park for free in Lot F43, across the street from Fairchild Hall, near the Teaching Development Center. Once in Fairchild Hall you can take the elevator to the 2nd floor and take a left down the hallway into the Rachel Cooper building, past the clinic waiting room area. Take another left right before the double doors and we are located in room 207. We meet the 4th Monday of every month from 7-8:30pm at Illinois State University, in Rachel Cooper 207.